I’ve been a vegetable roasting machine lately. 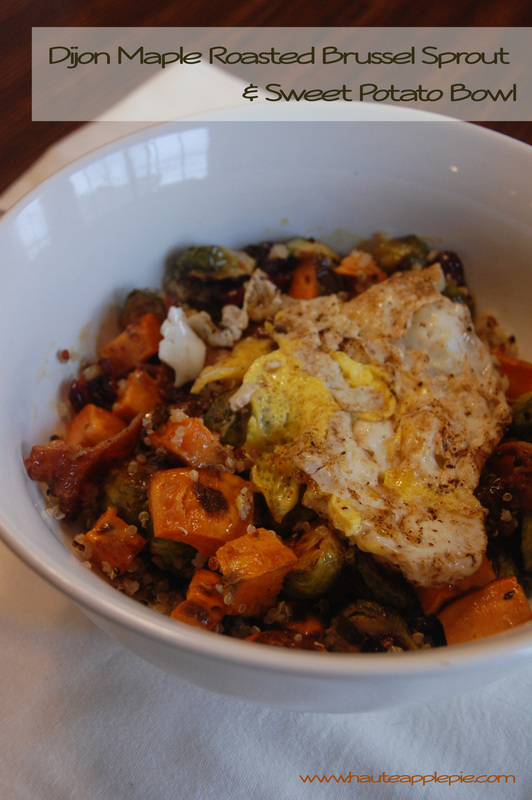 I love hearty roasted vegetables thrown on top of some kind of grain (couscous, barley, quinoa, etc. ), typically I toss some Sriracha on and call it a day. I recently bought some beautiful Brussel sprouts and wanted to make more of a planned meal out of them. This dish, combined with the hint of sweetness from the maple and the tang of the Dijon are a perfect pair. 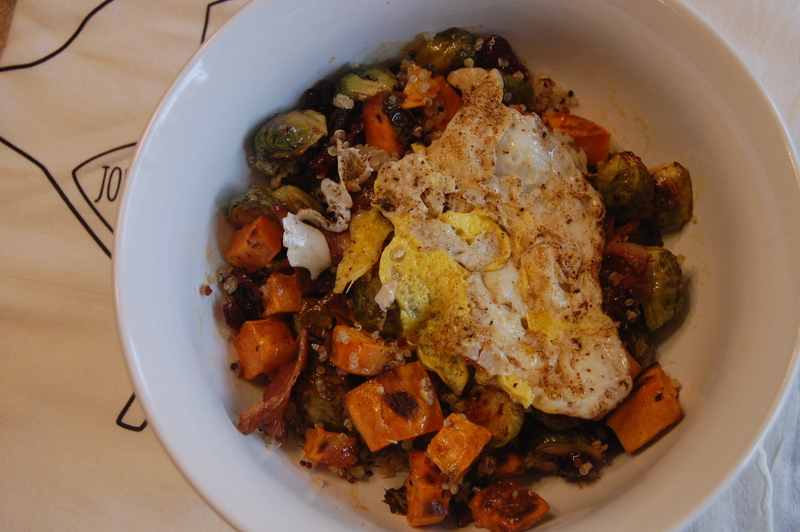 The runny egg on top really takes the cake (an addition I made while eating the leftovers). Preheat oven to 400 degrees. Spread sweet potato and Brussel sprouts on baking sheet. In a small bowl, mix Dijon, maple syrup and olive oil. Brush over vegetables. Roast in oven for 30 minutes, flipping half way through. With five minutes to go, sprinkle dried cranberries on baking sheet. Remove from oven. Pour contents into bowl. Add bacon. Whisk together vinaigrette ingredients. Drizzle over vegetable mixture (you may not use the whole thing). Mix to coat. Place quinoa in bowl. Add vegetable mixture. Crack egg into small, non-stick, preheated skilled. Cook until egg white becomes thick. Flip and cook for one minute. Add to top of bowl. This looks amazing! Definitely giving it a shot this week!